Liver and Pancreatic Cancer affects more than 15,000 patients in the UK every year. There is still a scarcity of funds dedicated to research and development to improve early detection and surgical treatment to improve results and survival rates. Unlike many other forms of cancer, detection and cure rates for Liver and Pancreatic cancer have not improved in the last 40 years. The charity funds research that detects the early signs of these forms of cancer and enhances mini-invasive treatment and after care methods. Details of current research funded by us is set out below. Updates on progress will be included in our news section of this website. The Southampton Hepatobiliary Pancreatic Team performs more than 250 major procedures every year for liver and pancreatic malignancies with the majority being via keyhole surgery. Their results and approach is pioneering and will have a positive impact on both patients and their families. The team recognised the need to create a charitable fund to further develop the surgical techniques, ensuring they become more widely available to Liver and Pancreatic Cancer sufferers. n ​This ground-breaking research into improving outcomes for patients suffering from liver and pancreatic cancer is funded by a grant from LAPR&D which commenced in May 2015. It is being carried out at Southampton University Hospital under the supervision of Mr. Hilal and Professor Salim Khakoo. The research involves harvesting healthy liver stem cells from liver specimens of patients who are undergoing liver surgery to be cultured (grown) outside of the body. As stem cells regenerate themselves it could mean that liver tissue can be generated out of the body. As the cells have been taken from the patient, stem cells have little chance of rejection, unlike with transplants. ​It could also help patients needing functional liver tissue whether they are suffering from non-functioning liver and waiting for a transplant or patients needing removal of a large part of their liver for cancer treatment. This could improve the outcomes for persons with serious liver disease. The study is focusing on human liver cell growth in laboratory conditions. Liver cells will be taken from the tissue of liver patients undergoing surgery. Patients have been recruited to the programme and experiments to grow the cells outside of the body will be conducted. 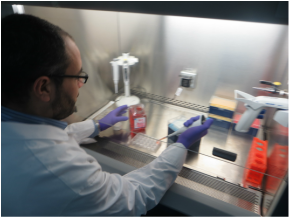 Protocols will be developed for the isolation and maintenance of liver cells to ensure the effectiveness and reliability of liver cell culture. ​Appropriate growth factors (hormones) will be identified to improve the survival and growth of the liver cells to ensure life long functionality of the new cells. Challenging factors include the identification of the right concentration of those growth factors to ensure viability of the cells whilst at the same time avoiding any toxic effects. In separate experiments, a collaboration with colleagues in the School of Bio-Engineering at Southampton University, aims to develop a three dimensional model for liver stem cells which may mimic normal liver tissue construction. Our vision is to realise a small liver functioning in a similar manner to the human liver but outside of the body - "a liver on a plate" if you will. This will open up new prospects for the treatment and management of patients with liver disease. Year 1 funding of £35,839 allows this research, led by Dr. Pardis Arvinrad, to commence in March 2017. The research will last for a period of 32 months subject to continuation following an annual review. 2. Discover new drugs for the treatment of metastatic pancreatic cancer – at present there are no drugs that only target pancreatic cancer cells whereas there are for liver and breast cancer for example. This is a particularly exciting research project that aims to detect early warning signs the cancer and develop drug treatments that can help patients. Regular updates on this research programme will be provided via our website news pages and charity newsletters. LAPR&D are to buy 100 to 200 bubble/ water/spirometry machines emblazoned with our logo to be given to patients post surgery. They allow patients to breath better, clear their chests and reduce the risk of chest infection particularly post-surgery. They are also understood to aid physiotherapy. Patient feedback will be obtained to see whether the benefits are sustained over time. LAPR&D are also investigating whether the use of chewing gum helps to avoid dumping syndrome post op. Before a gastrectomy (removal of part or whole of the stomach) your stomach digested most of the sugar and starch. However, after surgery your stomach can no longer do this, so your small intestine has to draw in water from the rest of your body to help break down the food. Chewing gum might help produce the liquid required. The idea needs further investigation before implementing - we will keep you posted!